After going through a hectic day at work, you may need some water therapy. What could be better than a hot tub? However, there is a constraint, not everyone is able to get a standard hot tub at their home. Like many solutions, this one also has a solution and it is inflatable hot tubs. They give your body a complete spa treatment. They are convenient in terms of their use and price ranges. If you are planning to buy one for yourself, then this article can help you. Our collection of best inflatable hot tubs of 2019 can give you a clear idea about which product to spend your money on. 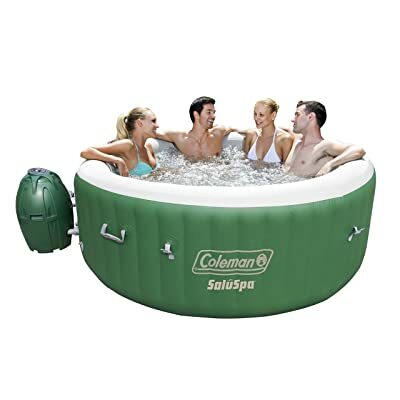 The Coleman inflatable hot tub holds about four people and is a great way to relax with your friends. The tub has soothing bubble jets which make them great for massaging your muscles. The control panel is a digital touchscreen that can be controlled when you are in the tub instead of coming out and changing the settings over again. 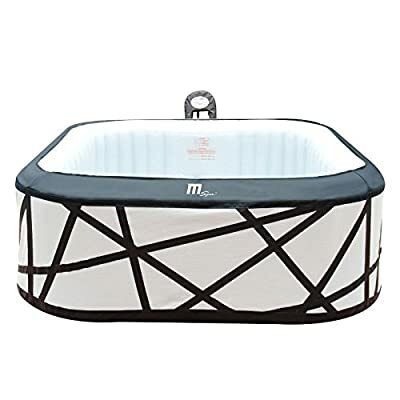 The material of the tub is soft and comfortable inside and the outside, because it is made of fabric so that it remains more durable and less likely to be punctured. The maintenance is also made easy with a water filter that is easy to replace. There are two sides with handles that can help you lift the inflated pool and when you are not using it, you can simply deflate it and store it or carry it anywhere that you like. This hot tub comes with a chemical floater to ensure that the water remains clean and smooth for a spa-like experience. It holds about 210 gallons of water. 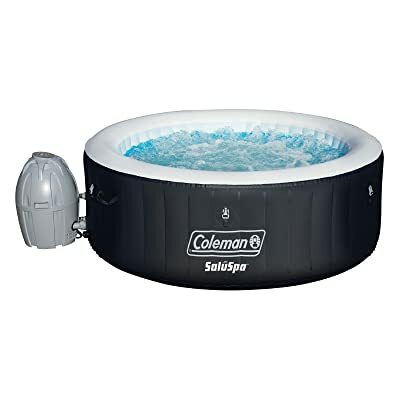 This Coleman SaluSpa Inflatable AirJet Hot Tub is a source of great pleasure for your drained body. With its spacious structure, four people can relax in this bathtub simultaneously. Being an inflatable hot tub, it is portable. You can get your water therapy anywhere you want. The walls of this incredible product are built using TriTech material. Moreover, it comes with beam construction. These features add durability to the tub while offering an opportunity to sit against its sides. You can operate it with the help of its digital control panel while sitting inside the tub. Furthermore, its soft touch system makes its operation easier. It offers speedy inflating and water heating. It comes equipped with a great power of 114 air jets. All these features along with a cushioned floor give you comfort while you sit inside your mini spa. It also contains a toughened inflatable cover that contains safety lock clips and built-in air chambers too. This Coleman product also has two side handles that make it easy to transport. On purchasing this product, you will get a pool liner, pool cover, chemical floater, two filter cartridges, air pad protector, spa pump, AirJet system, and repair kit. Contains 114 AirJets that gives off great soothing effects. Side handles make it easy to carry around. Digital control panel gives convenience for setting different parameters. With its durable construction, this hot tub serves you for a longer time period. Massage jets helps in relieving tiredness. AirJets might produce less massaging effects as compared to water jets. Doesn’t contain built-in seats or headrests. 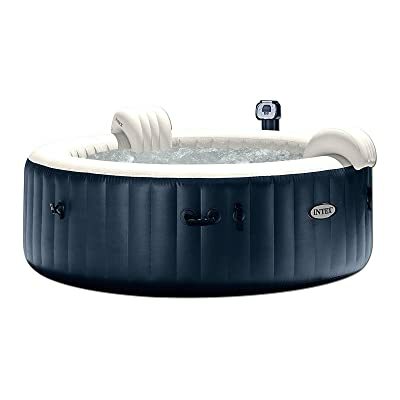 This Bestway 54155E Hawaii Inflatable Outdoor Spa is another great inflatable hot tub 2019 option. It contains certain attributes that can completely relieve your body after having a tough day. It contains enough space to accommodate 4-6 people easily. Now, you can enjoy some luxury time with your friends and family. Setting this outdoor spa up is very easy. It can be assembled within minutes without needing the help of any tools. Its walls are constructed using tri-tech material that gives this tub additional durability. It comes with Salute-massage system that is equipped with 114 all-surrounding air jets. These jets are enough to give you the feeling of a standard hot tub spa. Moreover, it contains an automatic start and stop timer. This helps in saving power with the help of a controlled heating system. It also possesses a cover along with safety lock clips. This helps in maintaining optimum temperature. Furthermore, its filters and chemical floater which adds more convenience to its maintenance. Its built-in insulation chamber serves the purpose of maintaining water temperature. This hot tub is noisy as compared to the standard indoor spa. You might have difficulty in setting it up for the first time because there are no detailed instructions. MSPA 132 Jet Inflatable hot tubs provide you a very relaxing and therapeutic experience wherever you want. This hot tub is best for those who want to enjoy a drink with a friend and a great view. It is designed to soothe your tired bones after a long day. With silent technology and many more features to ensure this purpose, this product is square shaped, inflatable and white with black leather trim which has a soft texture that makes it more comfortable and accommodating. The spa features a built-in heater, control system, four people capacity and 132 air jets. These air jets produce bubbles that give you a very airy feeling that helps you relax. The water keeps warm while you keep it plugged. The negative aspects of this hot tub are the long hours it takes to heat the water. One would hardly want to wait that long to enjoy its luxury, and the control panel is situated very far away making it inaccessible from within the tub. One of the best options if you want to pamper yourself while having a fun time with your loved ones and friends. The hot tub accommodates up to six people at one time. The spa is easily installable with the help of the guidebook and you will face no difficulty setting it up. It comes with a filter cartridge that keeps the water clean. The round shape ensures the capacity of this spa machine. The robust I-Beam construction allows you to sit on the side walls of the spa. The walls are made with a Tritech technology that makes them highly durable. It inflates quickly and rapidly warms the water up to a 104 degrees Fahrenheit with 60 encompassing air jets. The hot temperature is ideal for calming sore muscles or relaxing after a prolonged day and the advanced control board gives you a chance to alter the temperature without getting out of the tub. The Intex Pure pa Inflatable Bubble hot tub is a relaxing hot tub with easy features. With just a push of the button, you have a hot tub suitable for up to six people. There is a bubble jet machine that can be used to produce up to 170 bubbles for a massaging touch. The water can be heated according to your preference in about 20 minutes. The pump to help in pumping air into the hot tub comes with the product to reduce any additional costs and efforts that regular hot tubs might make you pay. The filter cartridges come with the tub and can be easily replaced for fresh and clean water. Fiber Tech technology of the material is used and has a three-ply laminated material which makes the tub comfortable, durable, and resistant to puncture. The hot tub also has a built-in water treating system that makes the water cleaner and smoother for a more relaxing experience. When you are done, you can deflate it and carry it anywhere in its carry bag or safely store it. It is important that you consider the size before purchasing the tub, including how many people you want to fit in the tub. You can get a variety of hot tubs with different size accommodations. More often there are 2-3 people, then a tub with 4-6 people capacity is enough. Purchasing a tub with more space uses more water, longer heating time, and the high price of course. That’s why you need to make the choice wisely. You should decide where you are going to place your hot tub. This is very important to plan first. Though few tub seats have an equal number of people, their exterior size may still vary. Therefore, it is important to compare the available space and the overall size of your hot tub before buying it. Durability is one of the most important factors we normally consider in every item we purchase. For inflated hot tubs, it is their construction material that significantly decides its longevity. Cheaper tubs are constructed using single or dual layered materials. They are not going to serve you for a long time period. You can enjoy a period of a single season or a few months. However, if you want some durable product, then go for custom engineered material or triple-ply. This is because ply count is proportional to the product sturdiness. In the market, you can look for TriTech or FiberTech materials, both of them are triple-ply. That’s why they can stay the same even after facing rough outdoor elements. After resolving the space and durability issues, comes the mode of operating the product. In hot tubs, you need to adjust the water temperature, make sure it is simple and easy to access. A simple digitally controlled panel with some clear LED display is a requirement for this product. Moreover, it is important to see if you can access it while sitting inside the tub. Otherwise, it will become tough to go out of the tub merely to set the water temperature. Temperature is a factor that asks for your least attention. It is because in all types of hot tubs whether standard or portable, you will get the maximum temperature of 104 degrees Fahrenheit. It is the maximum safe temperature and all manufacturers follow the same standard. Usually inflated hot tubs come with a plug. You can put this plug inside any usual outlet available at your home. No special set up or wiring is required to operate these hot tubs. As inflated hot tubs don’t come with seats, it is important to go for padded or cushioned floor hot tubs. Normally, these cushions inflate with the main unit of tubs. They give more comfort and relaxation to your body. Another important factor to look for while purchasing hot tubs are the jets. Normally, you can get tubs with numbers of jets ranging from 100-200. The greater the number of jets give more pleasure while massaging your body. However, you will also get to see AirJet and water Jet tubs. Look for this feature carefully according to your requirements. The shape of this item is a thing that doesn’t matter much. However, it makes a difference in a way of your spa’s appearance and internal space. Usually, you will see these tubs in a round shape. Some are available in a square shape. Their shape offers more space for you because of its corners. For any product you purchase, it is important to look for its safety measures. Outdoor hot tubs are usually placed on the ground or any other outdoor location. They are exposed to different elements including debris, sharp objects, and others. That’s why it is important to have some additional protective layer. A ground cloth is a thing that can serve this purpose by providing an additional bottom layer to your tub. Most inflated hot tubs are available with covers too. These covers help in maintaining optimum water temperature. It also protects your spa from dirt and dust when you will leave it outside. These covers are available in different types of materials. However, you won’t need to get it if you are not going to leave your hot tub open and running for a long period of time. Besides basic features that are important for the regular operation of your hot tub, there are a few additional features as well. These can add to a more fun experience by giving a real spa like feelings. For inflated hot tubs, you can purchase a variety of accessories. These include LED lights, headrests, cup holders, carry bag, filters, chemical floaters, pool sponges, spa seats, entertainment stations and more. Getting these accessories depends on your choice and budget. 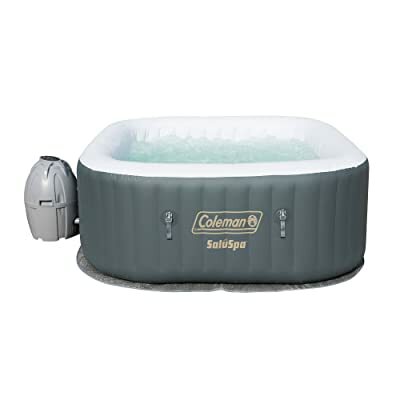 The inflatable hot tubs are a great way to enjoy standard spa-like treatment while staying within your budget. They can also be useful for those living in rented areas. In order to get maximum benefits out of your purchased product, all basic features should work perfectly. 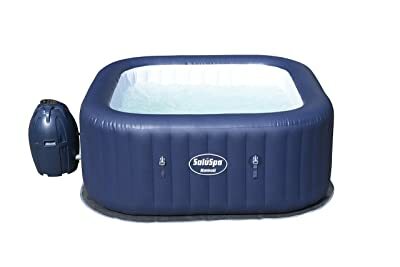 In this write-up, we have provided a list of the best inflatable hot tubs of 2019 along with a brief buying guide. We hope after going through it, you have gotten a clear idea about your sought after item. A product offering durability and all requisite features while sticking to your budget is a thing you can consider as the best. 1. What should the size be? One of the most important decisions that you will have to make is the size. If you are opting for one only for yourself then something with a small size can be enough for you. However, if you will be using it in a group then you will have to consider the number of people and purchase one accordingly. If you do not have any particular considerations then you will have to see where you would want to place it. If space is not an issue, then you can even go for bigger ones and use them for individual purposes too. While you consider space make sure to have a plug near the area. Inflatable hot tubs require regular electric sockets just like any other household appliance. Wherever you put the tub, make sure to have a plan for plugging it in too. 2. How do I maintain the hot tub? If you do not choose a very durable or special material then the hot tub can be tricky to maintain especially because it is inflatable. Make sure to read the manual on how to keep the hot tub safe and well maintained. Usually, there will be water filters that you will have to change or you will have to add chemicals or in any other form to prevent microorganisms to enter the water and cause problems. Keep in mind to check whether the hot tub is dry before storing it and making sure that it is clean form all foreign particles. If your hot tub comes with a bag, keep it in the case for storage. 3. Do inflatable hot tubs have seats? The design of the inflatable hot tubs is similar to wading pools. They are simply a pool with some features to make it a spa-like hot tub. They do not have built-in seats and manufacturers do not recommend any other external seat in the tub. They are still very comfortable as their base are soft and well cushioned. The lack of seats allows people to move around freely and have a more comfortable experience. They do sometimes come with headrests for a more comfortable approach. 4. Can inflatable hot tubs be used indoors? Yes, they can be used indoors or outdoors but you will have to check the flooring. The hot tub will cause the temperature of the flow to rise so make sure to check with your contractor or a professional if the floor will be affected with the heat. Also, you will have to make sure your floor is leveled and does not have a pointy spot which can cause the hot tub to puncture. 5. What are the hot tub jets used for? Not all hot tubs have jets in them. Jets are responsible for making bubbles in the water. These bubbles are of pure and filtered water in the hot tub which makes them smooth and helps with hydrotherapy. They increase the price of a regular hot tub, but if you are looking for something to massage other than soaking, then this is a great option for you. If you opt to use jets, keep in mind that you will have to regulate the temperature. Bubbles will cause the temperature to fall faster. It will also take extra time if you turn on the jets while the water is heating. 6. Can I add bath salts in the hot tub? No, do not add anything in the water as most of the time inflatable hot tubs have a filtration system to keep the water clean of any foreign particles. Adding salts might even be bad for the body of the tub. However, if you wish to add salts, then you can get the ones that are specially made for soaking purposes of you can get the approved soothing agents for the hot tub. Keep in mind that any foreign particle can be highly dangerous which is why the hot tub is working constantly to keep the water clean and smooth. Covers may seem to be an unimportant feature but they are very useful. You can use them when the tub is not in use and you want to keep the water clean. They also help in keeping the heat inside of the tub when it is not in use. Covers do not cost extra if they are included in the hot tub. You can get them separately as well but it is highly recommended that you get the ones with the product for best results. Is it perfect Intex Pure Spa Inflatable Bubble Hot Tub ?